It’s no secret that search engine optimization is a key element for online marketing. When it comes to increasing Google ranking for real estate investors, you need to know SEO front and back. If you need a refresher, check out our SEO Guide for Real Estate Investors! 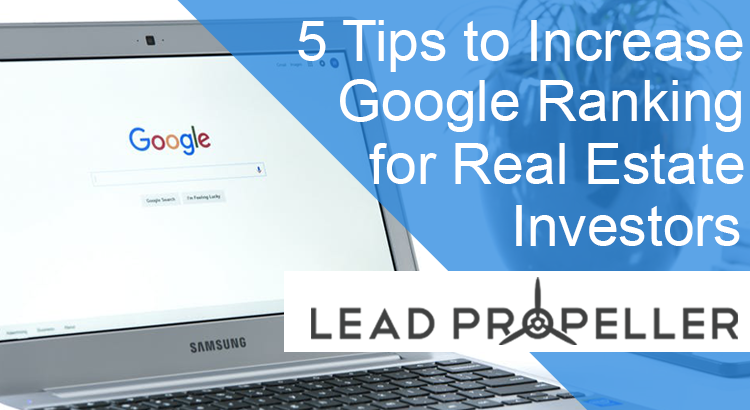 In this article, we’re going to give you the top 5 tips to increase Google ranking for real estate investors so that you can get your business in front of more motivated sellers. Keywords are everywhere. Seriously. Keywords are in meta tags, titles, in articles, on website pages, in FaceBook posts, in YouTube descriptions, and so on. Just because they’re all over the place doesn’t mean that they aren’t thought out. If you’re not basing your keywords on data, then you run the risk of making irrelevant content. The more research you do, the stronger your content will be, and with that comes higher Google ranking! This tag is the title of the page (kind of obvious, I know), but it does still need to be optimized. This is the most important part to include your keyword or keyphrase in. For example, our meta title for this article is “5 Tips to Increase Google Ranking for Real Estate Investors“. It seems pretty long, and a little straight forward, but this title is optimized with our keyword, target audience, and has a buzz phrase that’s attention grabbing. These tags are where you need to not only include your keywords, but also a short description of what the content is. You’ll see these descriptions below the titles of Google searches. Meta descriptions are important for two things when it comes to building Google ranking for real estate investors. Arguably, telling search engines about the content is more important (sorry audience). If you’re optimizing your meta descriptions correctly, then search engines like Google and Bing will be able to better categorize your content. While using meta descriptions doesn’t directly effect your ranking, it does help to show what the contents of your, well, content is. This makes it more appealing to your audience, and their interaction with your link does determine ranking. 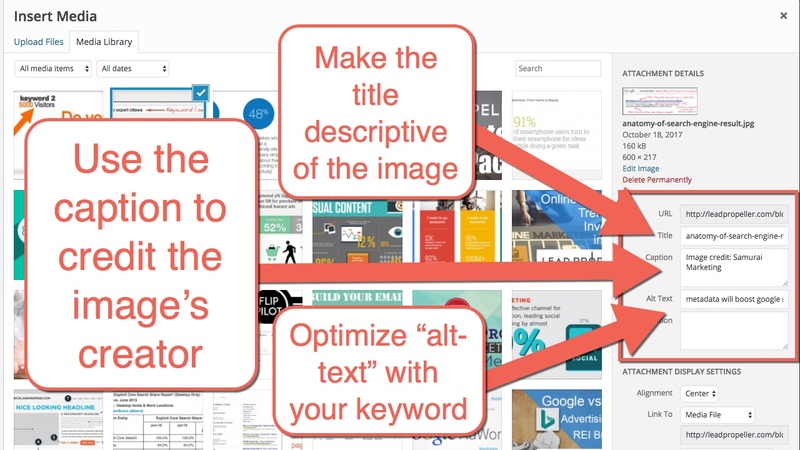 Using images in your blog posts is great for search engine optimization, which is how you increase Google ranking for real estate investors. However, when you use pictures you need to optimize them correctly (as well as credit them the right way to avoid copy right issues). Optimizing your pictures isn’t difficult, but there are steps you need to take. Choose the right image. We suggest using websites like Pexels and UnSplash, because those images are all CC0 licensed. Compress you image for web use. This will make your page load faster, making it easier for your audience to access. We use TinyPNG to compress our images because it’s free and awesome! Name your image. Use a descriptive name for your image. For example, if you put a picture of a house on your webpage, name the file something like “family house”. Making sure the name of the file is related to your content will help your Google ranking. Optimize Alt-Text! Alt-text isn’t something that your readers will see. Instead, Alt-text is meant entirely for Google to help increase your rankings. Your alt-text needs to have the keywords featured in it. You can find your alt-text in the HTML for your blog post, or in the WordPress “add media” panel. You’ll need 3 – 5 pictures per post for the best search engine optimization. Images help your readers stay interested in your content, while also providing more information for Google to help increase your ranking. As we know from our article about user interaction, bounce rates are a factor in Google’s ranking algorithm. If someone goes to your real estate investing website on their mobile device, don’t like it, and then leave quickly, Google will see that your website wasn’t the answer for that visitor’s search question. That’s a huge problem when it comes to ranking. Remember, if Google doesn’t think your website is valuable to searches, it won’t rank you high on the page. Your website needs to be able to resize for smartphones and tablets in a way that still looks good and keeps your visitors navigating through your content. Luckily, if you have a LeadPropeller account, we’ve already made your site mobile optimized. Our websites will resize for mobile devices, and load quickly to prevent a high bounce rate. Unfortunately, we understand that not all real estate investors have a LeadPropeller website (sad, we know). Depending on the type of website you have, you’ll have to check to make sure it’s optimized for mobile devices. One quick way of doing this is to resize your browsing window down to make sure your website resized instead of clipping the text and images. If it doesn’t resize, then you’ve got a problem. One that can be easily fixed with a LeadPropeller website (cough, cough). Let’s face it, this is difficult stuff. 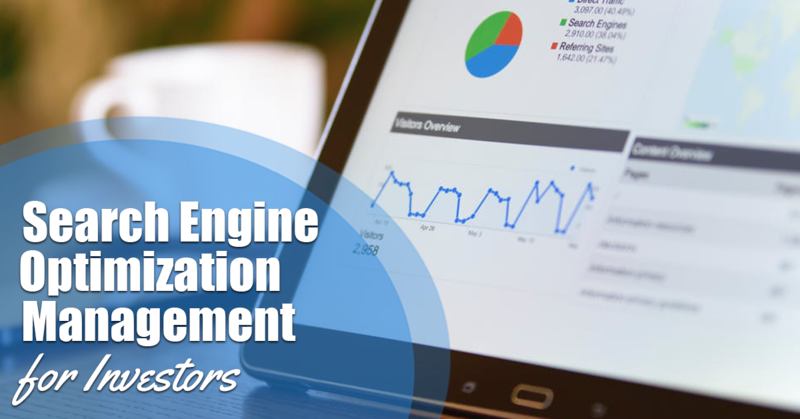 Search engine optimization takes time, and an in-depth knowledge of how search engines work. You can take SEO classes, or read every blog post out there, but the bottom line is this: You’re a real estate investor, not an online marketer. You have much more important things to do with your time. At LeadPropeller, we have a team of highly skilled professionals who specialize in increasing Google ranking for real estate investors. Our SEO service will build up your business’s back links and content so that you can start growing your online presence to rank organically in Google searches. On top of our amazing professional services, if you’re a LeadPropeller customer, you can take advantage of our content building features like our Content Packs. These highly optimized, professionally written, search engine optimized articles will feature your business name, target area, and contact information while also linking back to your website and other reputable sources. You’ll be building your search engine optimization in your sleep! If you have any questions about signing up for LeadPropeller, or our services, don’t hesitate to call our team at (210) 999 – 5187. We would love to answer any questions you might have!